Deciding on a design ought to be amongst the first steps you take. Make a wish list. What is it you want from your garden. Your garden should reflect your lifestyle. The simple plan to the side and shown as a three dimensional image above is an example of a garden where the owners spend lots of time entertaining with large decking, patio areas and with plantings to give visual pleasure. 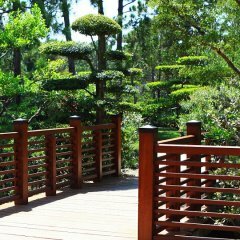 If you have little ones and enjoy playing ball games with them, you should plan for a lawned garden, edged with borders of sturdy evergreen shrubs, grasses and definitely not have borders of delicate plants or flowers. 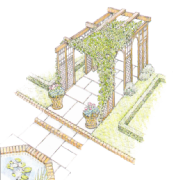 It is without doubt best to design your garden on paper before you start out on the practical side of your garden design. First roughly sketch something out on your sketch pad or piece of paper, after which you can improve the design as you go long. Start by making a plan of your current garden. Including just about everything, and drawing the plan to scale. Draw in your boundaries describing whether or not they are fences, walls or hedges. Also jot down the hedging style as well as whether they are deciduous, evergreen, clipped or natural as well as noting the spread of the hedge as well. Also show the existing plant borders, vegetable garden and storage areas. Note the orientation of your garden, putting north on your plan as well as marking where the shadowy areas are. Additionally, it is extremely important to make note of where the services are that run through your property. Where your electricity cables, water and gas pipes run. This can save you the embarrassment of cutting through them when working on your garden.